Empowering young women to dream big and reach their potential is something that teachers work towards daily in both big and small ways. I believe that now, more than ever, we need to reaffirm our female students' worth explicitly. 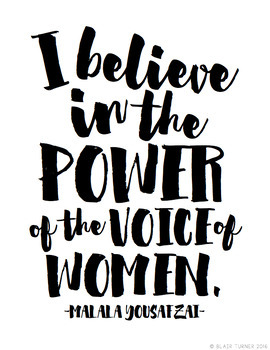 This set of printable posters includes quotes from 10 influential women. It is my hope that students and teachers, regardless of gender, will find these words to be thought-provoking and inspiring. You may choose to simply hang them on the classroom wall, or you may wish to use them as a jumping off point for further discussion and reflection. All the pages are in black and white for easy printing, and there are two versions included for each poster. The first version includes cursive fonts more appropriate for older students and/or staff, while the second version offers a cleaner and simpler option. Click here to find more of my character education resources.